Unemployment, Foreclosure, Deunionization: A Look at the State of the Economy and Organized Labor in Michigan | Democracy Now! Detroit-based journalist and the editor of Labor Notes, the largest circulation cross-union national publication in the country. Before joining Labor Notes, Kutalik was a local union officer for Amalgamated Transit Union Local 1549 in Austin, Texas. JUAN GONZALEZ: A report released by the Federal Reserve Wednesday suggests that some of the country’s most populous states are already in a recession. Michigan, with the highest unemployment rate in the country and one of the highest foreclosure rates, is near the top of the list. Over 200,000 Michigan residents have lost manufacturing jobs since the year 2000. And the latest union contracts with the big three automakers include major concessions. It’s no surprise that Tuesday night’s Republican primary in Michigan was dominated by concern over the economy. Former Massachusetts governor and Michigan native, Mitt Romney, said he would work to rebuild the state’s car industry by lifting the regulatory burden on companies and boosting research to generate new jobs. Arizona Senator John McCain, on the other hand, said that many of the car industry jobs were gone forever and offered a plan to bolster job retraining programs. Romney won the Republican primary with 39% of the vote. AMY GOODMAN: Chris Kutalik is a Detroit-based journalist, editor of Labor Notes, the largest circulation cross-union national publication in the country. Before joining Labor Notes, Chris was a local union officer for Amalgamated Transit Union Local 1549 in Austin, Texas. He has been closely following the pattern of deindustrialization and deunionization in Michigan. Chris Kutalik joins us now from Detroit, Michigan. 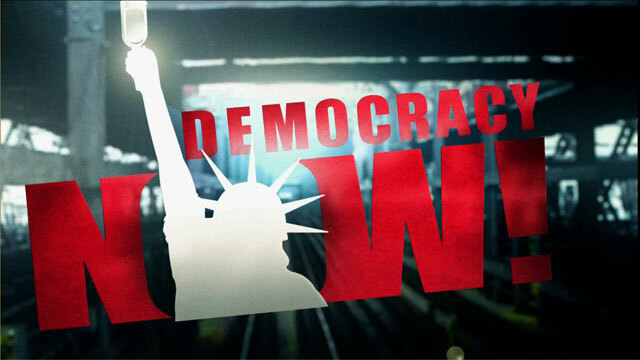 Welcome to Democracy Now!, Chris. Can you start off by talking about, well, where you are, Michigan, the power or the decreasing power of the United Auto Workers, what happened during this primary, and the state of the economy there? CHRIS KUTALIK: Well, as you noted, that we have the highest unemployment rate in the country at 7.4% . That’s been growing pretty steadily, as — the worries about the recession, we’ve already been in it here for several years, and for many reasons. It’s — we run a sort of a one-horse town, the city of Detroit, Southeast Michigan and in general — that is, the auto industry. And so, where goes the auto industry and the big three automakers, so goes the region. And unfortunately, what’s happened, you’ve seen this sort of process of, as you mentioned, deunionization and deindustrialization. There’s a sort of common myth, I feel, that in this country that heavy manufacturing or manufacturing bases has disappeared, that we’re not making cars anymore, and that that has sort of shifted away from that. But we are making cars. That’s the reality, is that there is still this tremendous level of production of cars and trucks in this country, but mostly what it’s being shifted from is away from the big three automakers and toward these foreign transplants — Toyota, Honda — building these large assembly plants and sort of the constellation of auto parts plants all through the South, in Mississippi, in Kentucky, in Alabama, in the state of Texas. You start to see these non-union companies out there. Now, unfortunately, what’s happened is you started also to see the slipping of the living standards and the wages of — the economic foundation of this region, too, which is basically its work force. For many years, autoworkers have been sort of the foundation, the motor, those who sort of pump money back into the economy. And what you’ve really seen there is them take a tremendous beating — tens of thousands of layoffs. And, as was mentioned earlier, a terrible concessionary contract with the last big three was signed over this fall. And that’s having a tremendous impact in the terms of the living conditions of autoworkers and those sort of dependent on them. JUAN GONZALEZ: Well, Chris, in terms of the primary that just occurred, I was surprised that there was a far larger Republican turnout in the Republican primary than there was in the Democratic primary, although, obviously, it was basically a beauty contest in the Democrats since there were no delegates. But your sense of why Romney was able to be the victor there? CHRIS KUTALIK: Well, I mean, there’s a few reasons. One is that Romney played the native son card quite well. His father had been governor. He emphasized the fact that he had been a — his first job was as a private security guard at Chrysler, and that he had worked for a big three auto company, and played that card particularly well. His organization was heavily focused on winning in Michigan. And so, I feel like they had — that it was really sort of the elements of his victory. It certainly wasn’t the message that he was saying: his economic policies were having a heavy resonance in most sectors of the state. And as you mentioned, the Democrats, having no real contest here at all, certainly felt like there was an element of disenfranchisement for many working-class voters, for many African American voters, and those who would have voted in that — in those primaries and felt like they could have been putting forward their issues in this election — just simply didn’t happen because of the punishment from the Democratic National Committee. JUAN GONZALEZ: I’d like to ask you also — we just had a segment on Nevada and what’s going on there with the caucuses and the labor movement. Nevada obviously is the fast-growing state for unionization in the country. It’s had enormous increase in its unionization levels there in recent years. But the battle on organized labor, in terms of these Democratic candidates, has become a lot more complex. The Culinary Workers, which came out suddenly to back Obama, their parent company — their parent union, UNITE HERE, also endorsed Obama after unofficially really backing Edwards for a while. They sent their chief of staff of UNITE HERE to be a chief of staff at the Edwards campaign and were commonly thought to be with the Edwards camp. Suddenly, they switched and came out officially for Obama. Your sense of what’s going on among some of the labor unions across the country as they face what to do about the Clinton, Obama and Edwards race? AMY GOODMAN: We’re talking to Chris Kutalik, the Detroit-based journalist and editor of Labor Notes. He’s based in Detroit. The Michigan primary just took place. But today we’re looking at the landscape of labor around the country and how it plays into this election. Chris? CHRIS KUTALIK: Sure. So the unions are basically — the mobilization that’s happening this year is particularly unprecedented in many ways. You have the AFL-CIO spending $53 million alone on political mobilization efforts. That’s get-out-the-vote efforts. That’s mobilizing volunteers. They’re saying they’re going to mobilize 200,000 volunteers. They’re saying their affiliates are going to put $200 million — it’s fifty-five unions that are members of AFL-CIO, and that doesn’t include the Change to Win unions, which, of course, are some of the major other — other major largest unions who are pumping tremendous amounts of money. So you have an exponential increase in that, and so, therefore, you also have a sense that unions feel like they’re playing, and union leaderships feel like they’re playing real power-brokerage politics. And so, I think what you have — it was a surprise for many labor observers that UNITE HERE didn’t end up endorsing John Edwards [inaudible]. You know, he, for many years, had been an active supporter of that union during UNITE HERE’s national bargaining campaign called Hotel Workers Rising. John Edwards toured the country with Danny Glover, made many appearances at protest pickets. And so, it felt like there was a shoe-in in terms of his support. JUAN GONZALEZ: And then, of course, there are unions like the Service Employees International Union, the largest union in the country, that is actually pretty much split, isn’t it? A huge number its locals backing Edwards, its Illinois contingent backing Obama, and its New York and East Coast contingent, 1199 and others, backing Hillary Clinton. CHRIS KUTALIK: Yeah, I think that there’s — what’s happening is — and you’re starting to see this friction not just in SEIU, but in many unions. AFSCME, which is the public-sector union, had a big internal row over in Iowa. They pumped in almost $1 million of television ads. AFSCME has formally endorsed Hillary Clinton, its top leadership big backers of Hillary Clinton. They sent in almost 200 paid staff organizers. During that campaign, many of the ads that the union paid for directly attacked Obama. And you had a bit of a revolt inside of their seven midlevel officers, vice presidents, sending in — basically writing an open letter deeply criticizing the lack of democracy and the use of their union’s money and sort of attacking. So you’re definitely starting to see big frictions inside of the union — inside of the labor movement — as you mentioned, SEIU having internal differences, splitting almost three ways over various candidates. And, unfortunately, I feel that with the big money and with the big support and with the sense of — that there actually can be a victory, a Democratic victory, in November for the presidency and in the Congress, I think you see the unions sort of racing ahead, trying to find which candidate will be in the front of the pack, trying to be the influence brokers there and trying to put their machines behind it and see if that can be the difference for — in terms of influence once there is a victory and once sort of labor’s program can be worked on after that victory. AMY GOODMAN: And Chris, finally, your assessment of what’s going on right now in Nevada? I mean, stakes very high. I think union voters on Saturday in the Democratic caucus will be something like a third or more than a third of the voters. AMY GOODMAN: The struggle between the teachers and the culinary workers? CHRIS KUTALIK: You know, I think that what’s really unfortunate with this infighting around this is that, as your guest earlier had mentioned, the reason this was set up was to accommodate shift workers. And as we know, the caucus system, in many ways, sort of places some precedent and, you know, gives some priority to those who have much time on their hands. And as we all know, busy working people find it very hard to come down, participate in the hours-long process it takes in the selection of a candidate. This was a wonderful innovation, a way to facilitate the thousands of organized active political participants that — and this is one of the beauties of a good, strong union, is that kind of building of activist leadership. And so it was — these caucuses were defined basically to facilitate their participation in this process. And I think it’s really unfortunate that this sort of realpolitik that’s happening inside of unions’ leaderships is creeping into this and that rank-and-file workers will be disenfranchised because of it. AMY GOODMAN: Chris Kutalik, I want to thank you very much for being with us, journalist and editor of Labor Notes. He’s based in Detroit, Michigan.